Maen Bradwen. It is referred to in a charter of King John given to William de Braose in 1203, marking the boundary of Gower on Drumau Mountain. It is said that it bathes in the river Neath on Easter Monday! 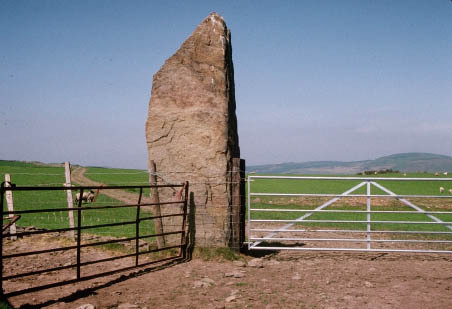 It is identified as an ancient Menhir, though its original function is wreathed in mystery - it could be either a monument of a buried Celtic chieftain or the capstone of an ancient cromlech or just a boundary stone. According to historian Rhys Phillips a gold torque and sword were once found at the foot of the stone. Today it stands at the side of a field gateway and is built into a field wall. There are, too, several Bronze Age burial cairns near Carreg Bica. It is now time to head back to Neath Abbey down Drumau Road and the Highlands. As one travels down Drumau Road, one passes under a viaduct carrying the main railway line from London to Swansea, via Neath. The first Great Western Railway line (built by Brunel) had reached Neath in 1850 and soon extended to Swansea by 1863. There was also the Vale of Neath railway -now closed - which ran up to Merthyr and was closed to passengers in 1864 [sic - but I think 1964]. 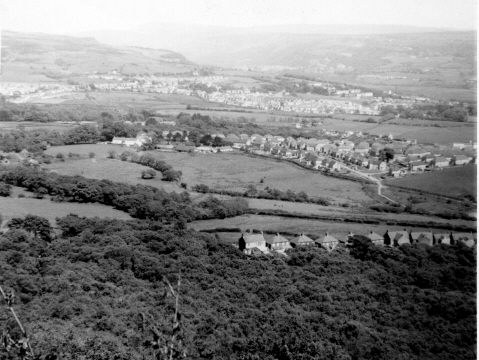 Even collieries, like those at Waunceirch and Bryncoch, once had a Dyffryn Clydach Railway line to Court Herbert. 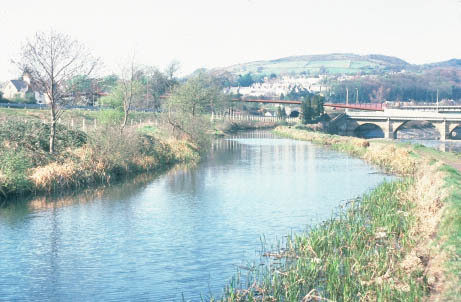 In addition to these railway lines, the Dyffryn Clydach area was served by the Tennant Canal, to be seen alongside the river. Running from Aberdulais to Swansea via Neath it was privately built by industrialist George Tennant, at a cost of £20,000 under the direction of engineer William Kirkhouse. It opened in 1824 and in the 1830's it was carrying coal at a rate of 90,000 tons a year, and it also had a passenger service. It carried coal, limestone and iron from the Dyffryn Clydach coal pits and the Ironworks. However, the coming of the railways in the 1840's led to its being used less and less until it fell into disuse by the 1920's. Today, alas, its only function is to supply water to industrial establishments like the Llandarcy oil refinery and B.P. Baglan Bay. This has changed further since this text was written, following the closure of both the B.P. oil refinery at Llandarcy (1998) and the B.P. Chemicals site at Baglan Bay (2004).